Don't miss out on Day 1 of Share the Love Week featuring Tim Holtz Distress Inks by Ranger focusing upon watercolor/watercolour. You are here at our third day of our Share the Love Week featuring Tim Holtz Distress Inks by Ranger! This is a week-long love fest when we focus on a company or product we adore and show how smitten we are by using our featured love with w&w products! Distress Inks are a fabulous product line brought to you by Ranger and the incomparable Tim Holtz. We recommend, if you haven't already, stalking following Tim Holtz's site and Ranger's site for more information and inspiration. This time around we want you...yes, you...to participate with us for a chance to win some awesome prizes. Our Third day is about a very fun technique: Resist! Grab some embossing powder or paint and your Distress Inks and lets have some fun seeing what you create to resist that ink! Before we get to how you can participate to win, let's see what Julie, Shay and Gayatri, Heather and Vanessa of The Talent have made. This project was totally exploratory and I had no idea what I was going to make, but I knew I wanted a tag, and I wanted to work with a resist technique. I found a 12 inch circle stencil in my stash that has dotted circles in various sizes and widths. I actually couldn't find my Distress Paint for this, but I did find some liquid acrylic paint and some trusty makeup sponges and created a gradient effect that changes from aqua (bottom left), to green to pale yellow (upper right). This was drying really fast mainly because I didn't need much paint to get this effect – gotta like that. I did dry it with the heat tool just to be sure it was dry before I added my distress inks. Using the ink blending tool I added inks in bright colors and also sprinkled the tag with water droplets (spritz and flick) and then dried the tag. The water reacts and leaves droplet marks that lighten the color of the ink. I added two more stencils - one of triangles (triangles on left side) with picked raspberry ink and smaller vertical dots with seedless grapes. The paint had no problem resisting the ink . Using Archival ink in Jet black, I added the camera from TheWrite Stuff: Picture Perfect in 3 different places and the word smile from Bubble Talk ink picked raspberry in 3 places, and a stack of “celebrate” in more of the seedless grapes. 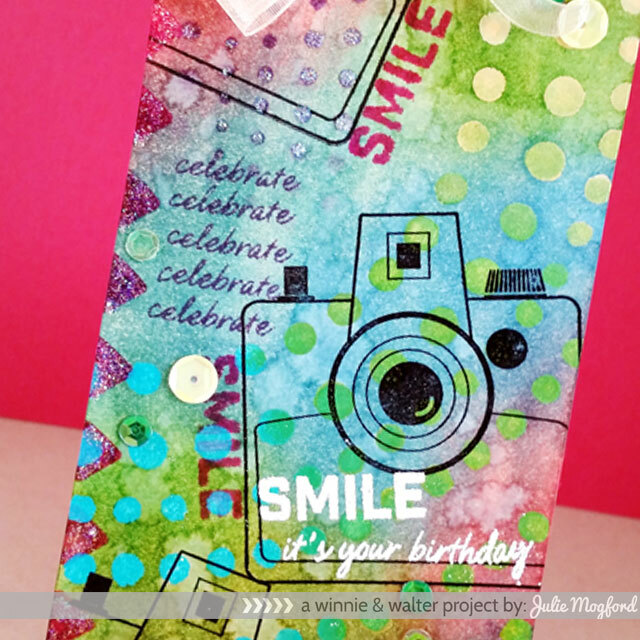 Since this card is pretty colorful and busy, I added the SMILE it’s your birthday stamped with Versamark and embossed white for a little more prominence on the card. Stickles? Yes please!!! More stardust stickles on the tiny purple dots at the two corners and on the row of stenciled triangles. I scattered a few sequins and added a fluffy bow to finish it off. 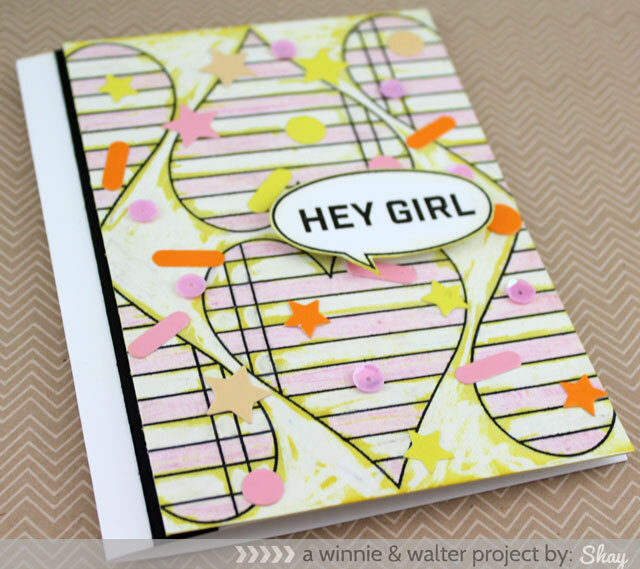 Color, visual texture, resist and sparkle – tag-alicious! I took an unorthodox approach. For my resist card I went back to kindergarten by pulling out my crayons. Yes, crayons can be used as a resist! The wax repels the ink. I love how easy they are to use, the large array of colors and the smell takes me way back. I stamped the ledger heart from The Write Stuff: Love Story in onyx black Versafine and created a pattern. I colored in the hearts with white and a pale pink crayons. Around the hearts I colored in with the white crayon. I then used my handy ink blending tool by Ranger and squeezed lemonade Distress Ink and added the color over the entire panel. Lastly I buffed the panel with a paper towel to remove any ink adhering to the crayon wax. What I love is all the imperfections in coloring are shown when the ink seeps into the paper not covered with crayons. The less you color with the crayon the more prominent the Distress Ink. I added sequins and confetti from Studio Calico. I stamped the speech bubble and sentiment from Bubble Talk in black ink and cut out. I edged the speech bubble with a little of the squeezed lemonade with my ink blending tool. I adhered it with dimensional foam adhesive. I added a small strip of black cardstock under the edge and adhered it to an A2 white card base. CLICK HERE to see more of Gayatri's project. CLICK HERE to see more of Heather's project. CLICK HERE to see more of Vanessa's project. Want to win a care package by Ranger? Ranger has generously donated a prize of a mini ink blending tool, replacement foam and two (2) sets of Distress Ink minis. Wow, that is awesome. You can comment once on this post. 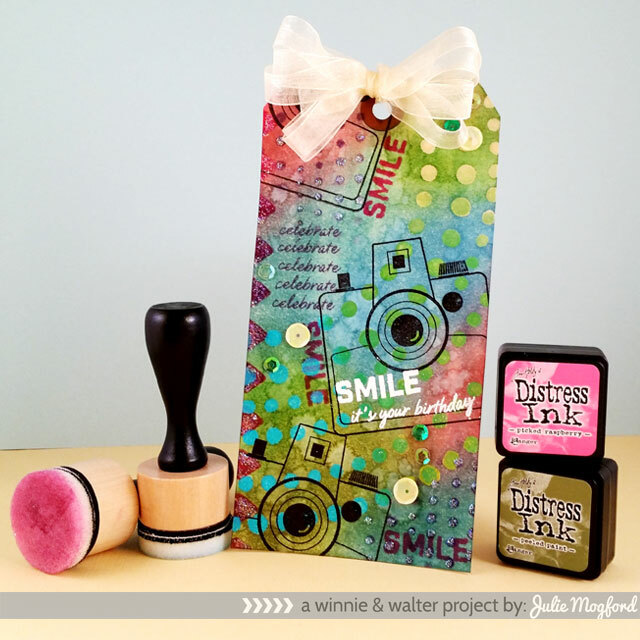 You can create a new resist project using Distress Inks + at least one (1) w&w product (this can include stamps, cut files, digital products and/or one of our freebies found on our website or for our Facebook fans) and add it to the Link-up tool found below. You may enter as many times as you wish while the challenge remains open. We will randomly pick a winner from the comments and challenge entries that entered by Sunday, July 13, 2014 at 11:55 p.m. CST. Love this technique and the amazing projects showcasing it. Beautifully crafted and so inspiring!!!! So many beautiful cards here! I love the card Shay made using crayons! I would never have thought to use that as a resist medium! So clever! Talk about inspiration!!! WOW! Love the cards...and the inks! Thanks for the chance to win! These are fabulous!!! I LOVE this technique and love seeing the different ways it was used! WOW! I've been "this close" to giving up on using my distress inks, but you've sparked inspiration to keep on working with them! The projects shared here are amazing; the tutorials: bonus! With all these ideas shared, who can 'resist' giving some of these fabulous techniques a try! The resist technique is one of my faves and todays cards showcase it wonderfully! Gorgeous inspirations :) these are just wow cards! Oh my such gorgeous cards!!! I love the Resist technique!!! It is so much fun!! Oh, love all of the colours seen here, beautiful resist technique cards! Great ideas and cards. Love this week of distress inks. Resist is such perfect technique for Disatress Ink! Great projects again! I really love the Emboss Resist technique and it works so well with Distress Inks. Great DT samples again! Beautiful creations, love this technique!!! You really created amazing projects. 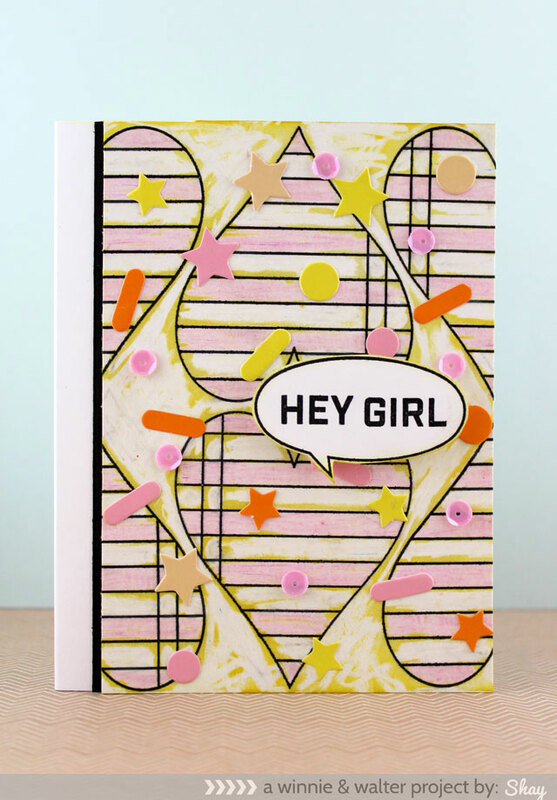 It's always magic when you use embossing! Love the samples again today, and thanks for a chance at the minis! WOW, awesome projects! Love the background on that tag!! I have the inks, I need to get some of the blenders, they look like they make working with the inks so easy. These are some seriously awesome projects! I love the different ideas! I love this technique! It's one of my favorites! I also think the projects today are so awesome! Oh another of my favorite techniques and I love how distress inks works with it!!! LOVE these distress ink projects! Everyone one did such a nice job - love all the bright colors! Love Distress Ink! Thank you for the chance to win some more! Gorgeous! Gorgeous! Gorgeous! Stunning cards and tag! You all rock! Love mixed media, love distress! Some brilliant projects here. Love blending. Love your big word stamps, they really are eyecatching. And even more incredible inspiration today! What fabulous creations ladies!!! Super cool cards and resist technique! I love how you showcase a particular technique and all the dt's designs are so different and wonderful! LOVE it! WOW - amazing projects!! I LOVE Distress Inks - there is so much you can do with them (my fav being the watercolor effects)! I just got the first six sets of distress minis and I am in love! They are so fun to play with! GREAT projects today! i so want to try those minis! => THANK YOU for the CREATIVE INSPIRATION!!! What a wonderful collection of color! Fantastic job! I appreciate the opportunity to acquire some of those beautiful inks! Another day of stunning cards. Distress resist is one of my favourite techniques. Another brilliant array of cards! I've just received my first ever distress inks and didn't know where to start so this week has been fantastic for me!! I am really needing some playtime. Where are those "Lazy" days of summer? I've only got the crazy days of summer. I just love this resist technique...great projects. I love distress inks! Gayatri and Heather have really knocked it out of the park with their amazing cards!! Seriously LOVE! Hope I have time to play!!! Love this! Crayons as a resist? Who knew? Great ideas. I love seeing all these great ideas!! Great examples using the resist technique! Resist is kenning my favorite distress ink techniques! Loving these gorgeous cards! What a fun challenge - must get my thinking hat on! Love all the projects that the DT have shared with us this week. So much inspiration! Can't resist doing some resist! Waiting for inspiration to strike! Love these Resist techniques! Such pretty cards and an awesome prize! Thanks for the opportunity to win! Definitely going to try this. Thanks for the ideas! Great cards, especially love the hello my friend card! Great projects from the DT! Thanks for sharing! beauitful samples show casing the stamps!!! Fantastic cards. 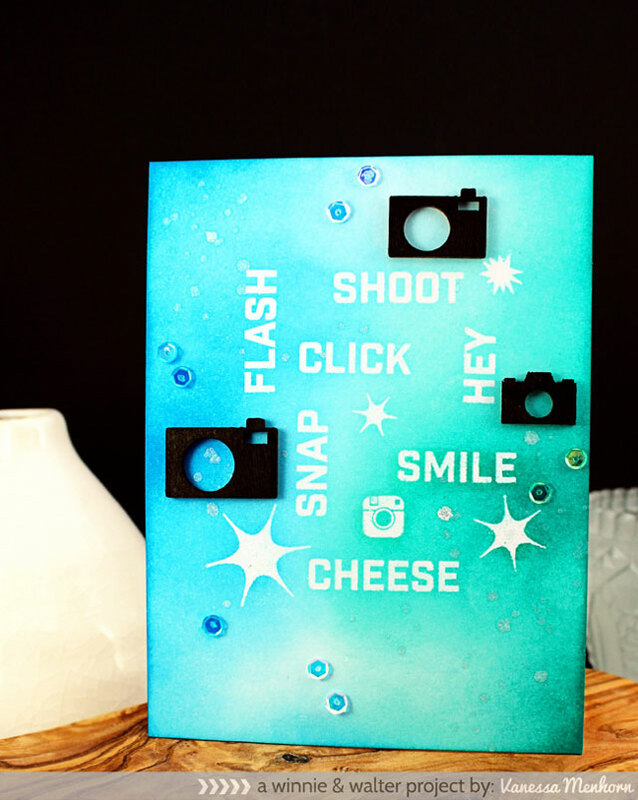 Especially love the little cameras and words on the last card. I love all the color in these cards! Great cards!! I especially love Heather's inspiration and Marlene's link!! Resist is one of my favorite techniques! !